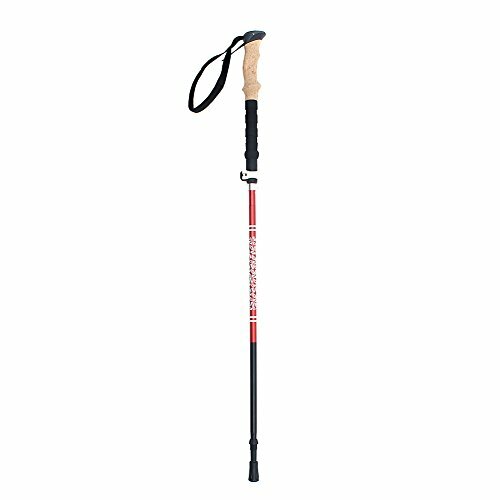 Climb the highest mountains with these High Trek Trekking Poles. 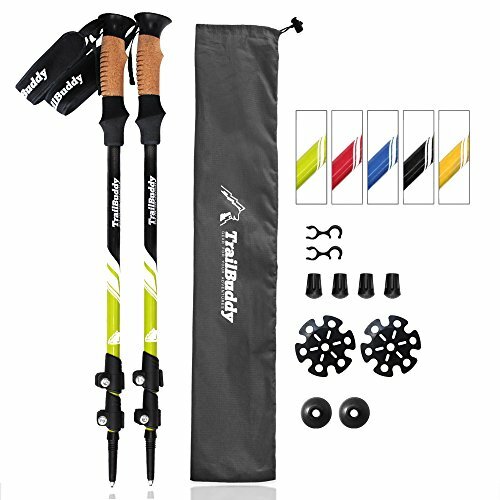 Each hiking pole can be adjusted in length from 64-135 cm (25" to 53") by unlocking our easy flip-lock system which is built to quickly adjust while preventing accidental retraction. 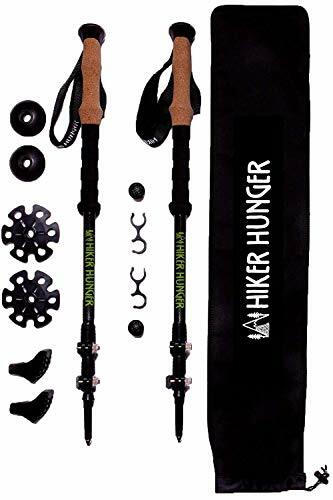 These 8.7 ounce Hiking poles come with mud/snow feet which quickly attach to the bottom to prevent the poles from sinking into softer material. 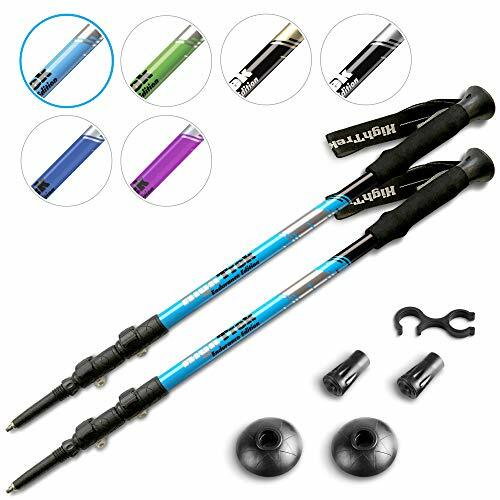 Many people who have trouble walking or have injury or joint problems have noted that they feel improvement in their mobility when using our poles. These collapsible poles retract to 25" and are easily stored when not in use. These poles are suitable for men and women, and make great gifts! Take your next hike to new heights with High Trek! 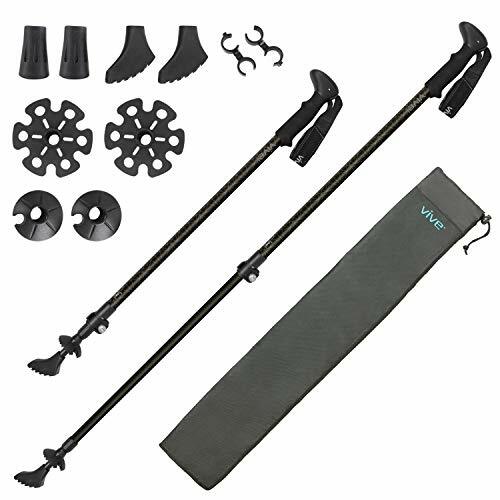 Quick Lock Carbon Fiber Trekking Poles with Cork Grip Looking for quality trekking poles at a great price? If so, the quick lock hiking poles from Cascade Mountain Tech are for you. 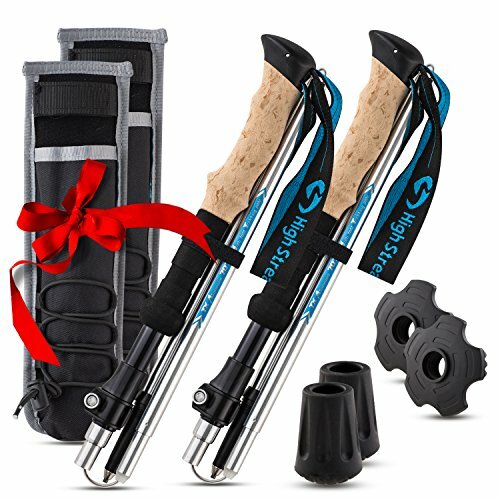 This pair of adjustable trekking poles are made from carbon fiber so they’re super lightweight. Plus, each pair comes equipped with tungsten carbide tips for ice or special terrain, rubber caps for general hiking, mud and baskets for use in snow. The size of the poles can be easily adjusted between 26 and 53 inches. As such, the poles are the perfect fit whether you are tall, short or somewhere in between. They are useful for hiking uphill, downhill and on flat terrain. 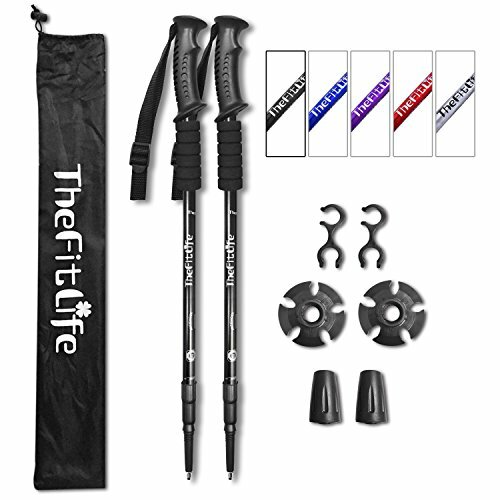 Since they weigh less than eight ounces, the poles won’t slow you down on the trail. Instead, they’ll improve your hiking endurance and allow you to reach new heights. See what king of difference trekking poles can make; order yours today! Assembly tips: 1. Take the folded poles from the carrying bag. 2. Pull the telescoping section out to tighten the cable and align with the folding sections. 3. Pull all the way out until the spring loaded pin pops out to secure the cable tightly. 4. Open the external lock to fine tune the height. (Notice: Please adjust the tension screw ONLY when the lock is opened). 5. Close the external lock after you finish height adjustment. Disassembly tips: 1. Open the external lock to shorten the pole. 2. Pull out the telescoping section so that you can press the spring loaded pin into the pole. 3. Fold the pole into the carry bag. 1 Single Pole Package Includes 1 x Trekking Pole 1 x Rubber Tip Cover 1 x Snow/Mud Basket 1 x Carry Bag 1 Pair (2 Poles) Package Includes 2 x Trekking Pole 2 x Rubber Tip Cover 2 x Snow/Mud Basket 2 x Carry Bag Outry Direct offers a 6-month money back or replacement warranty. 2 minute reviews on ultralight backpacking and camping gear Subscribe to "Bungzy's 2 Minute Review on Stuff I Wish I Knew About Stuff Before I Bought It". Save money by buying the right product the first time. Want more Telescoping Trekking Poles similar ideas? Try to explore these searches: Lollipop Birthday Party, Flower Ends Bail Pull, and Keychain Fire Starter.